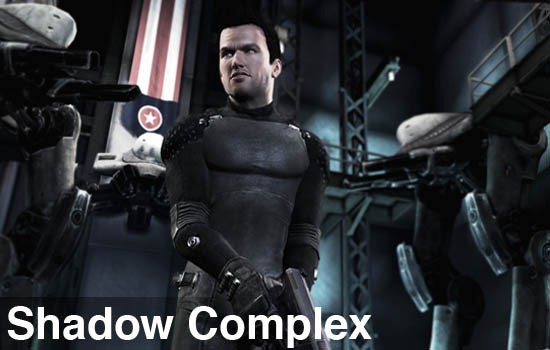 We only talked a brief bit about Shadow Complex on the site a few weeks back, and mostly it was due to its lack of cooperative play. But Shadow Complex is the perfect example of a game that in no way needs co-op play, it's a tight single player experience with high production values, great voice acting, and a cheesy fun story. Did I mention it was a $15 XBLA game? 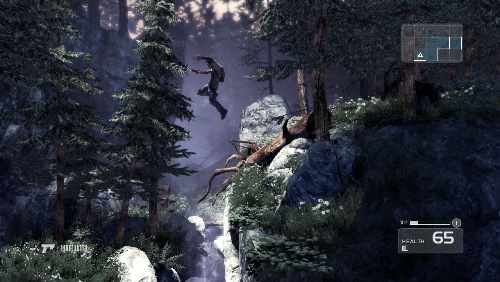 Shadow Complex is from developer Chair, who created the three player co-op game Undertow. Now under the care of Epic Games, Chair has create a side scrolling adventure which drops players in the role of Jason Flemming, sort of a super spy version of Nathan Drake from Uncharted. He's your everyday dude who just happens to know how to fire a machine gun...and scale huge walls...and wear a super suit to break the sound barrier. The adventure starts out when Jason and his girlfriend Claire decide to go spelunking, and when Claire goes on ahead only to disappear - things get interesting. Someone decided to build a secret underground lair in that cave, and Claire somehow gets caught in the middle. Why are damsels in distress always named Claire in video games? Comparisons have been made with Super Metroid in play-style, which comes from the game's explorable map and unlockable areas. You'll transition from gorgeous outdoor forest levels to technology filled bunkers in a hybrid 2.5D view. 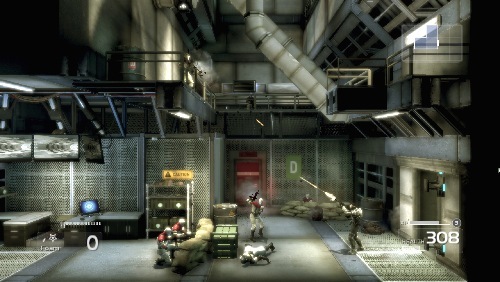 Enemies can appear right in front of you, or can be seen coming out of structures in the background. And while you are limited to one plane of movement, its incredibly easy to dispatch anyone on the screen in any depth of field. The game does an admirable job of auto targeting the enemies depending on where you are aiming. As you explore and unlock the map, take down enemies, and collect items, you'll earn experience towards your character. You'll slowly level up unlock new abilities making it easier to navigate the map. There's even a multiplier system built in to increase the XP gained - for instance hand to hand combat can yield you greater points, or even knocking an enemy of a ledge and getting them to scream. The latter is actually an achievement, of which the game does an excellent job with. Taking a queue from other Epic titles an on screen progress indicator shows you how far along you are to the specific achievements, as well as compares how well you are doing to your friends. Your flashlight becomes your tool for discovering secrets and obstacles. Doors, grates, fans, and other objects glow with a colored hue to let you know which tool, or rather weapon, is required to reach the other side. Missiles, grenades, guns, and foam...yes foam...are all required to access certain areas of the map, especially secret areas with items. Speaking of the map, the entire game is absolutely enormous containing over a hundred different rooms, all incredibly detailed. Shadow Complex does a nice job of mixing things up the pace by throwing in some entertaining cut scenes with some solid writing and top notch voice acting. You'll come across fully 3D turret sections as well that transitions the slower based side scrolling gameplay into a shoot em up carnival fest of destruction. It's just enough of a distraction to keep things fresh. A lot has been made about the length of the game - with most finishing it around 5-6 hours. Total playtime for me was around 4 hours and 20 minutes with a little over 50% of the items collected. There are speed runs of the game of less than one hour, but you can NOT complete the game in this time on the first run through. Your character and equipment is simply not in a high enough level. The game screams re-playability, and with a dozen or so different items to collect and upgrade, there's plenty to unlock and keep you busy until you reach 100%. Not to mention a whole set of challenge rooms with times and score goals to achieve. Shadow Complex is hands down one of the best values on Xbox Live Arcade right now. At times you'll find it difficult to believe this isn't a full $60 retail title, especially in today's day and age. Chair has found the perfect balance between old school gameplay, new school graphics, and gentle upgrades all around. Page created in 0.5852 seconds.